Is Africa The Next Big Global Marijuana Market? While South Africa’s parliament continues to struggle with whether to legalize dagga (marijuana) or just allow medical marijuana use, the rest of the African continent continues to produce and use cannabis at rates that rival North America. More cannabis is seized by police in North America, but Africa is a very close second place. Behind the United States and Mexico, South Africa is the country with the third-greatest amount of cannabis seized, making up over 40 percent of all African cannabis seized. In the UNODC’s World Drug Report 2015, Africa’s estimated rate of annual cannabis usage by people aged 15-64 is 7.5 percent, almost double the global average of 3.9 percent. 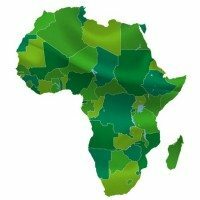 Africa’s continental rate is third behind Oceania at 10.7 percent and North America at 11.6 percent. However, the West- and Central-Africans are using at rate of 12.4 percent of their population per year. Cannabis is not native to Africa. Historians estimate its arrival on the continent took place in the 14th century as Arab trade came to Ethiopia. By 1881, German explorers Hermann Wissman and Dr. Paul Pogge explored areas in what is now the Democratic Republic of the Congo and found a tribe called the Bashilenge that smoked cannabis as often as possible, attributing to it magical powers. They called themselves Bena-Riamba, or “the sons of hemp” and their greeting moio meant both “life” and “hemp”. Now cannabis is becoming an economic engine in parts of Africa. UNODC’s Cannabis in Africa notes that Lesotho, the independent nation surrounded by South Africa, produces 70 percent of the cannabis that enters South Africa. Cannabis farming in Lesotho ranks as the third-largest source of income in a country where over one in four are unemployed. In Swaziland, surrounded by eastern South Africa on the north, west, and south, and Mozambique on the east, unemployment hovers at around 40 percent. There, the New York Times in 2012 profiled grandmothers who are cultivating the powerful marijuana strain “Swazi Gold” for sale in South Africa. The country, Africa’s last absolute monarchy, also boasts the world’s highest HIV infection rate, leaving these grandmothers to raise the orphans of their own sons and daughters. “Without weed, we would be starving,” said one peasant farmer to the Times. Even so, a typical family cannabis farm in Swaziland is producing 25 pounds of marijuana that sells for just 400 American dollars. In case any North American growers reading this are complaining about only getting $1,600 per pound of harvested marijuana, imagine having to compete globally with Africans willing to produce for one percent of that price. That time may be coming sooner than we think. While no country in Africa has yet officially legalized cannabis, Mozambique, on Africa’s southeast coast, has a strong marijuana culture and family cannabis plantations are largely tolerated by authorities. In 2011, there was a 900 percent increase in cannabis seized from Mozambique compared to the year prior. As marijuana prohibition falls in several of the United States, justification for international treaties forbidding national marijuana legalization becomes harder to maintain. African countries feeling the brunt of global economic downturn will eventually warm up to the billions in revenues and skyrocketing growth of the marijuana market. Someday, the “Durban Poison” strain you’re smoking may have been imported legally from near Durban, South Africa.